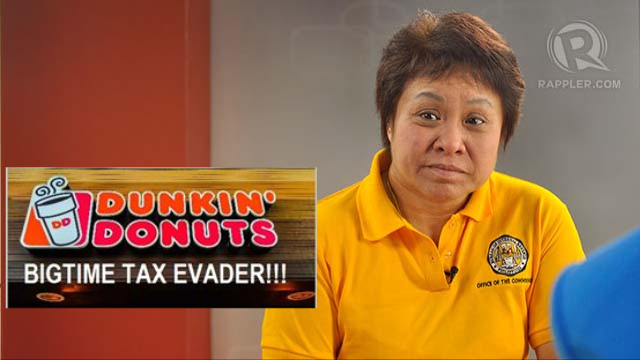 Ex- Bureau of Internal Revenue (BIR) Chief Kim Henares was indicted by former BIR revenue officer, Othello Dalanon to have “fooled the Filipino people” and tried to “conceal the truth” about the Dunkin’ Donuts tax evasion case. He accused Heneras of “intentionally failing to collect and file appropriate charges” against Dunkin Donuts for Php 1.56 billion in unpaid taxes. Dalanon stated in his blog that Henares “fooled the Filipino people when she said that his tax assessment against DD showed inaccuracies.” On February 28, 2014, Henares said in an interview with GMA-7 that “Dalanon’s tax assessment against the company was erroneous and the case had to be reinvestigated twice” He added that she even opposed her statement when she claimed that she did not order “two re-investigations” of DD tax case on the later. Dalanon added that Henares and Sales claimed that these findings were flawed but failed to give any justifications or explanations in their counter-affidavits and in supporting affidavits of Atty. Rommel Curiba and Mr. Wilfredo Reyes, both of BIR national office. “Clearly, it did not conduct a thorough investigation as it did not even require respondents to submit DD’s tax case docket and copy of its actual “protest” which are very essential in the investigation,” Dalanon said. He also said that he was amazed that despite respondents’ failure to give answers to the above vital accounts, the Ombudsman still terminated the case. He also said that he was firm that the PhP 1.56 Billion tax assessment against DD attained finality and that DD failed to file a valid protest and submit the required documents within the period required by law. “Atty. Claro Ortiz knows so well that the PhP 1.56 Billion tax assessment against DD attained finality,” he added. Dalanon also accused that Henares fooled the Filipino people when she denied knowledge of DD’s irregularities. Sponsor Dalanon claims he personally reported DD’s omissions to Henares and recommended to her the criminal prosecution of DD for tax evasion under the much-vaunted Run After Tax Evaders (RATE) program of the Bureau. He pinpoints Atty. Jethro M. Sabariaga who was then Henares’s Chief of Staff, knew so well that he personally talked to Henares about the case. Moreover, Dalanon said that Atty. Sabariaga first read his audit report before it was given to Henares. “I even send the same copies of my reports on DD tax case to Henares’ official e-mail address,” he added. Dalanon also added that Henares lied to the people because there were no reports and evidence that Henares ordered the two reinvestigations on DD tax case that existed.